Saving money can be difficult at the best of times, but what if you had an awesome coin bank to motivate you to do so each and every day? Making your own money-saving device isn’t only good for your back pocket – it’s also a fun and simple project to tackle on a rainy afternoon. That’s why we’ve rounded-up 40 of the most incredible DIY piggy banks that are both adult and kid-friendly! From coin banks made using cardboard and wallpaper, to glass jars, tins, plastic bottles and more – trust us, you’re sure to find a few projects here that tickle your creative bone. So, let’s get started! How cute is this DIY cardboard coin bank by ABC Creative Learning? Your kids will love making this little guy! What makes a basic mason jar more awesome? Mustaches and faces of course! About Family Crafts is the genius behind this tutorial. Who knew it was so cheap and easy to create a piggy bank from a plastic bottle? This DIY tutorial from All You is upcycling at its best! Saving up for a special trip (like a Honeymoon)? A Mom’s Take has this awesome DIY shadow box coin bank project that you’re sure to love! Here’s another cool tutorial using an upcycled bottle to create a DIY coin bank, this time from Bright Nest. What an awesome airplane! Cut Out and Keep has created this stylish yet understated coin bank using affordable materials. Find out how she did it by reading her full tutorial! How creative is this DIY pencil coin bank from Damask Love? It’s the most fun way to teach children how to save! Disney Family will show you how to create this fun little DIY piggy bank. This would be a great mother-child project to complete this weekend! Here’s another DIY piggy bank, this time featuring a miniature felt version from Dream a Little Bigger. Adorable! You can’t miss this bright orange coin bank from Dukes and Duchesses! Get crafty and creative with your own slogan. You can also turn some trendy water bottles into an awesome trio of coin banks to help you save, spend, or share. What a great idea from eHow! Do you have a little superhero in your life? Fireflies and Mudpies will teach you everything you need to know to make these cool DIY coin banks. Have a boring old piggy bank at home already? Why not ‘glitterfy’ it, just as Greta’s Day has done? Now it’s glamorous and glitzy! Here’s another trio of coin banks which encourages people to spend, save, and give. Thanks Homemade Ginger for this amazing tutorial! Fancy owning a self-sorting coin bank? Now you can make your own, because Instructables has this cool DIY tutorial for you! If you like to get crafty with old tin cans, then this DIY coin bank from It Happens in a Blink is certainly for you! Who would’ve thought that a Pringles tube could serve as the perfect DIY coin bank? Thankfully, Jennifer P Williams did! Want a DIY coin bank with a more masculine touch? Johanna Rundel has created this cool car-inspired coin bank for the special man in your life! Karina Garcia is the talented YouTuber behind this video tutorial which will teach you how to make a Starbucks coin bank. How clever! Who doesn’t love the Minions? KA Styles is here to show you how to recreate your own coin banks inspired by the popular characters! Saving up for a big Disney trip? Kimberley Marriott created these DIY Minnie and Mickey coin jars to encourage her family to save their dollars. Genius! Here’s another fantastic upcycling inspired tutorial. Kix Cereal turned some old cereal boxes into these adorable DIY coin banks! It’s incredibly easy to make these DIY turtle coin banks – just ask Krokotak! This is also a kid-friendly tutorial which they’re sure to love. 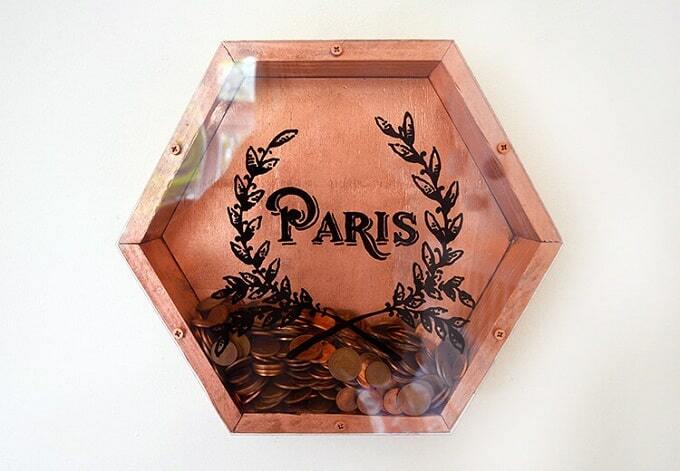 Wow, these wall-mounted coin banks from Lovely Greens has a gorgeous vintage aesthetic. What a great incentive to save! Mermag also has the most wonderful kid-friendly DIY projects! This one is no exception either – it features a cool coin bank to help children save, spend appropriately, and give to worthy causes. Here’s another Disney inspired DIY, this time from Mommity. It features a cute Mickey Mouse silhouette to motivate your next Disneyland trip! For another plastic bottle makeover, check out this tutorial via Musely! 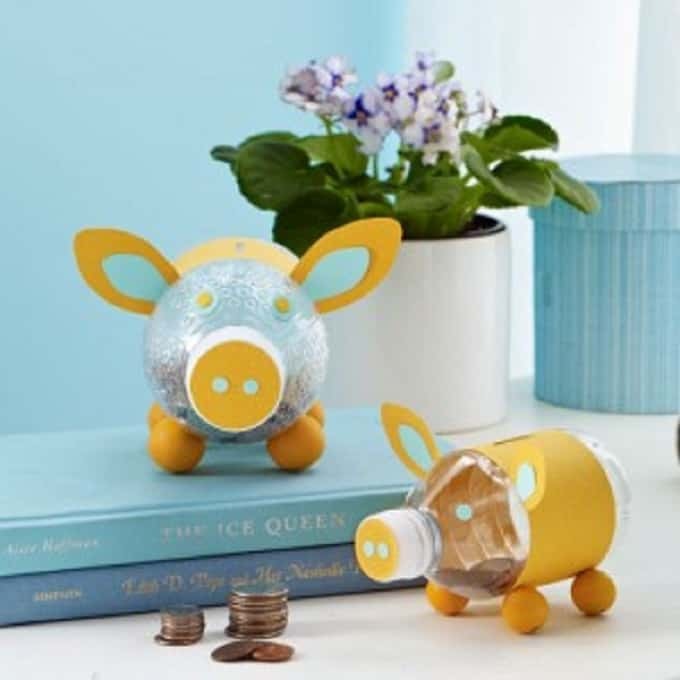 You too can make this adorable piggy bank. You can always rely on Paper & Stitch for a DIY with a difference! She has created this fun coin bank using wallpaper in vibrant and stylish patterns. Here’s a DIY piggy bank that won’t bust the budget! Parents.com created this one from a cardboard box. Your kids are sure to love this project! Got some old cans or formula tins lying around at home? Why not turn them into these fun DIY coin banks to help kids save, save, save? Thanks Parents.com for this clever craft idea! 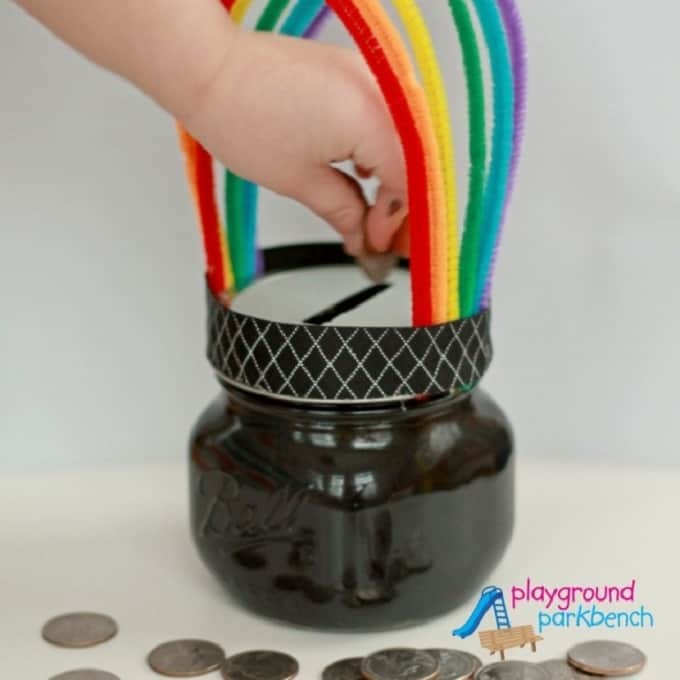 Wow, this DIY coin bank from Pink Heels Pink Truck has got some serious style! The gold makes it look especially glamorous. Teach your children to create their own little pot of gold at the end of the rainbow! Playground Park Bench has this fascinating DIY tutorial for you. You can even make your own paper mache dinosaur coin bank – does it get any better than that? Red Ted Art will show you how it’s done! Need a college fund? Make a DIY coin jar version! Say Yes created this amazing trio for her little ones. Did you know that a baby wipes tub could also double as a coin bank? What a great way to recycle and save! Check out the full tutorial via Sunny Day Family for more. This DIY save jar from Time with Thea sure is fancy! We love the gold color scheme. How’s this for a wedding wishing well that also doubles as a coin bank? Inspired by Anthropologie, Un beau Jour has created this stunning DIY painted globe. Got some ‘Mickey Money’ that needs to be saved? Create this DIY coin jar from Undercover Tourist to house it in! For those who are minimalists, this DIY cardboard coin bank from Instructables is sure to please you! What a clever contraption. We all need an ice cream fund from time to time, especially during the warmer months when the treat is basically an essential! Yesterday on Tuesday created this DIY coin bank which is pastel perfection. 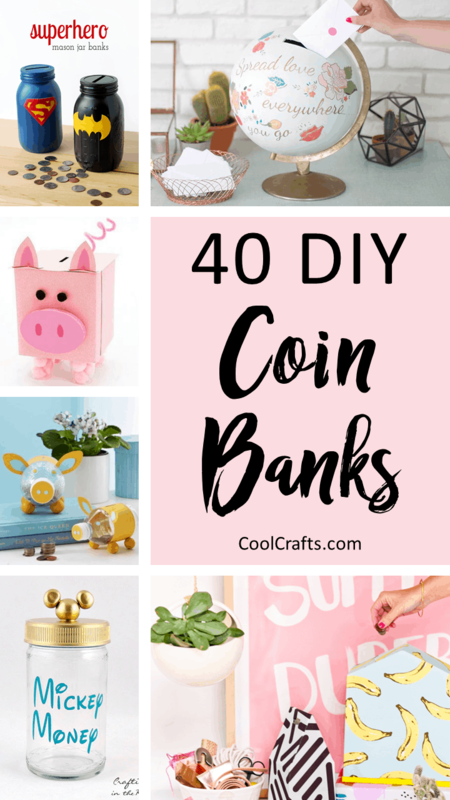 There you have it – 40 amazing DIY coin banks to help you save those dollars! Which projects will you be making? We’d love to hear from you in the comments section below!